As the video below is a preview for the remainder of the upcoming season of Gotham, there are potential bat-spoilers for those who prefer to be fully in the dark before watching. Fox’s comic book-inspired crime drama Gotham had quite a challenge when its pilot premiered last week, reintroducing characters that Batman fanatics are oh-so-familiar with, such as James Gordon and Oswald Cobblepot, while trying to disperse them into a fully realized fictional world. 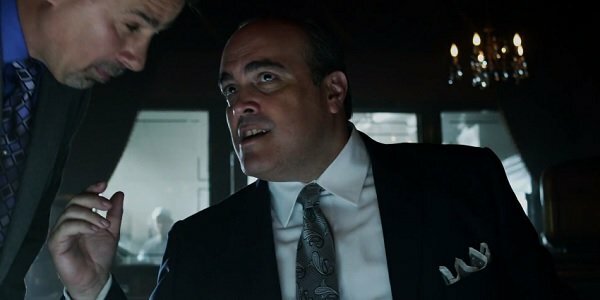 Those who were bothered by the endless line of future villain appearances aren’t going to be won over by the full season promo seen above, but the rest of us can cackle gloriously over our first looks at the murderous Victor Zsasz, the ruthless Sal Maroni and someone with a sack over his head that just might turn out to be the frightmaster Scarecrow. Or he might not. Cue the mysterious music. There is some footage from tonight’s episode of Gotham, “Selina Kyle,” in this preview, as well as some stuff with Bruce Wayne, but we’re bypassing all of the nitty gritty to focus on the more exciting bits: new bad guys and the very first appearance of Arkham Asylum! The latter comes into question as Mayor Aubrey James (Richard Kind) puts forth a plan to turn the undeveloped Arkham City into something worthwhile for Gotham City. Underworld kingpin Carmine Falcone isn’t going to like that one bit, but I’m guessing he’ll be even more pissed when Sal “The Boss” Maroni comes in and tries to usurp him. Take a look at the clean-shaven Dexter alum David Zayas on his rise to notoriety. 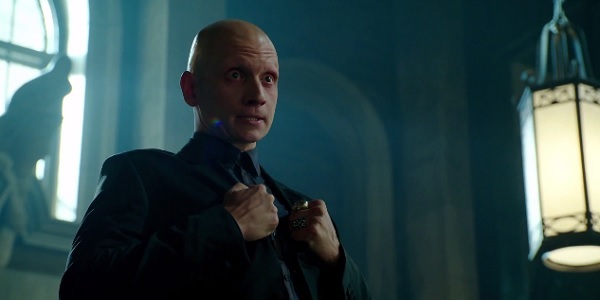 More exciting, at least to some, will be the introduction of the masochistic and sadistic Victor Zsasz, whose scars will probably tell more of his story than the writers will. We not only witness him shooting a man down in cold blood, but we also see him pull a John Doe as he waltzes into the Gotham City Police Department and calls for Gordon by name. That takes guts in a PD where some of the good guys are just as dirty as the bad guys. Or maybe that's why he feels comfortable doing it. And then there’s our hooded captor, who has a lovely young lady strung up with candles everywhere. Is this the Scarecrow, who hasn’t been in many Gotham conversations? Or is it the teased Dollmaker, who uses his victims for their skin. What do you guys think? 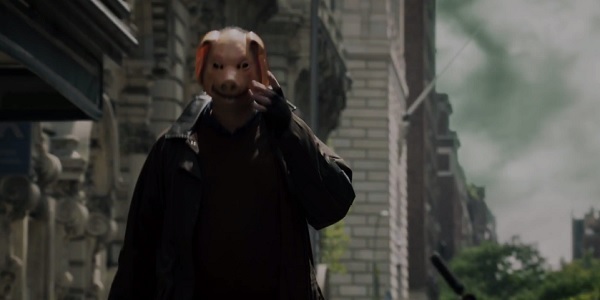 And while we’re playing the guessing game, is this guy below supposed to be minor villain Professor Pyg? It definitely isn’t the most go-to villain anyone would think of. Still, it’s quite possible this is just a fanboy nod rather than a real clue to anything. Maybe the Penguin knocks off a shipping truck full of pig masks. Find out where Gotham and its massive rogue's gallery will go next every Monday night on Fox.